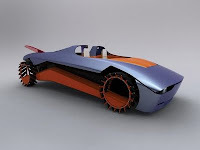 The Phoenix was just one of the entries in the 2009 Michelin Challenge Design, an annual competition that encourages vehicle designers to push the boundaries and think outside the square – especially where the rubber hits the road. 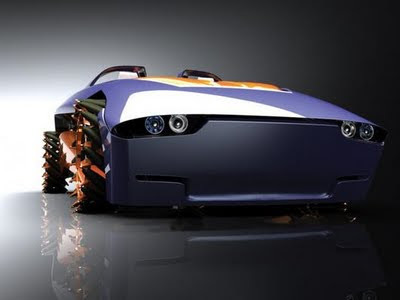 The Phoenix concept car features an orbital omni-directional four-wheel-drive system which allows for several types of motion - apart from moving forwards and backwards, it can rotate around its own axis and move sideways. The Michelin Challenge Design, now in its ninth year, has a different theme each year. The 2009 theme was ‘Brave + Bold - America’s Next Iconic Vehicle’. The Phoenix’s designers say the concept car was inspired by a combination of the American muscle car and the American’s favorite vehicle: the pick-up truck. Despite this, the concept would aim for some level of environmentally friendliness, being powered by a mid-mounted flexi-fuel V8 engine. The two-seater design also features body panels made from bio-composite materials that are easily recycled and roll bars and a safety cell constructed from reinforced bio-polymers.